it's as simple as that. . . .
What's a dog to do when he falls in love with the cat next door? Bark? Chase his tail? Dig up a "brass bone" and hope that the universal language of music will help him to express his feelings? 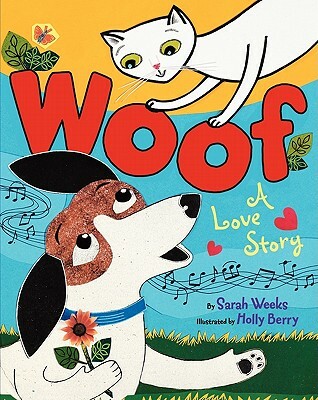 This humorous and heartfelt story is about the power of love and the power of music, told through the eyes of a lovelorn dog and the cat he adores. Sarah Weeks has written more than fifty books for young readers. Some of her picture books include Mrs. McNosh Hangs Up Her Wash, Sophie Peterman Tells the Truth!, and Glamourpuss. Her bestselling novel, So B. It, is a feature-length film starring Alfre Woodard and Talitha Bateman. Ms. Weeks visits thousands of students in elementary and middle schools across the country every year. She is also an adjunct professor in the prestigious MFA Writing for Children and Young Adults program at the New School. Sarah lives in Nyack, New York, with her husband, Jim Fyfe, and their dog, Mia. You can visit her online at www.sarahweeks.com. Holly Berry is an award-winning artist and illustrator of picture books for children. Her books include I'm a Pig by Sarah Weeks, The Gingerbread Cowboy by Janet Squires, and Market Day by Eve Bunting, among others. She lives on a blueberry farm in Maine with her family and a few pets—including a cat named Flossie.